The Norwegian exploration cruise line Hurtigruten has placed an order for two new hybrid powered expedition ships at Kleven Yards, due to be delivered in 2018 and 2019, in addition to an option for two additional vessels. These ground-breaking expedition ships will revolutionise adventure travel at sea. We are combining Hurtigruten’s more than 120-years know-how with cutting-edge technology and design, and a strong commitment to sustainability, to offer the modern-day adventure traveller unprecedented experiences, says Hurtigruten CEO Daniel Skjeldam. Hurtigruten has now decided to name the first two ships “Roald Amundsen” and “Fridtjof Nansen” after the two most influential Norwegian polar pioneers from the era when the company itself first started offering adventure travels. December 14th, it is exactly 105 years since Roald Amundsen became the first person in the world to plant his flag on the South Pole; it has been 128 years since Fridtjof Nansen skied across Greenland; and it is 120 years since Richard With, Hurtigruten’s founder, first started exploration tourism in the Arctic. What could be more natural and appropriate than to name our new ships after these inspiring trailblazers, says Skjeldam. The new ships are designed by Rolls-Royce, in collaboration with the recognised Norwegian yacht designer Espen Øino. With “Roald Amundsen” and “Fridtjof Nansen”, Hurtigruten also sets a new standard with respect to interior design and on-board customer experience. The aura of the period of the great exploration expeditions is to be recreated within the framework of modernity, and prime quality and comfort. The interior will mirror the breath-taking waters and landscapes in which the expedition ships will sail. It will be premium quality and stylish, yet unpretentious. Materials will be predominantly Norwegian and be inspired by nature, and guests will relish the distinguished environment created by the innovative use of granite, oak and birch, and wool, amongst other materials. All of which will be characterized by an innovative Scandinavian approach to interior design. We don’t take guests cruising, we take them exploring. A suitable on-board environment and atmosphere is essential to broaden and deepen the immersive experience of nature a Hurtigruten exploration experience constitutes, says Skjeldam. The ships will have large observation platforms on several decks for guests to get up-close to nature and wildlife. Six out of ten cabins will have their own balcony; two out of ten will be suites. The vessels will have three restaurants with menus reflecting local flavours and destinations. A special pool deck will include infinity pools, Jacuzzis and bars. 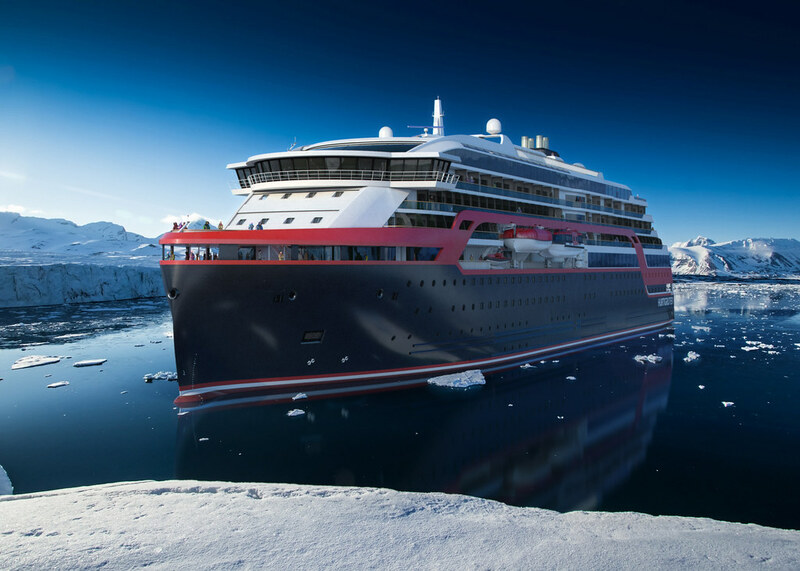 The new Hurtigruten exploration ships “Roald Amundsen” and “Fridtjof Nansen” will showcase the very latest in innovative environmentally friendly technology. New hybrid technology will make sailing with electric propulsion for 15-30 minutes a reality and substantially longer for ships to come. However, the total reduction in fuel consumption and hence CO2-emissions, is the main gain. The technology, in combination with the construction of the hull and effective use of electricity on board, will reduce emissions from the ships by 20 percent. Being able to sail employing solely electric propulsion is of great benefit for the environment – and also of our guests as it enhances the impact of experiencing nature. Imaging sailing perfectly silently along the ice edge in the Arctic or Antarctica, or along the banks of the Amazon. That is truly unique and exceptional, says Skjeldam. 2018 and 2019 itineraries for “Roald Amundsen” - Hurtigruten's first next-generation expedition ship - will be announced in November. First of Hurtigruten’s new class of specially constructed exploration ships for voyages in polar waters. Designed by Rolls Royce and are constructed by Kleven Yards. The ships will feature innovative Scandinavian designs, large observation platforms, infinity pools – and several other yet to be disclosed expedition features. New solutions will contribute to a 20 percent reduction of fuel consumption. In total, the two new ships will have a reduced CO2 emission of 6400 metric tons per year compared to traditional ships. In perspective, this is the same amount of yearly emissions created by 5540 new cars.